This study has 6 sessions, incorporating an introductory session and 5 lessons. The Study Set includes the Study Guide by Clifford M. Yeary and a commentary, Parables of the Kingdom, Jesus and the Use of Parables in the Synoptic Tradition, by Mary Ann Getty-Sullivan (Liturgical Press). The same commentary is used for Parables of the Kingdom–Part One, consequently, those planning to do both studies should order Study Sets for one of the studies, and order only the study guide for the subsequent study. 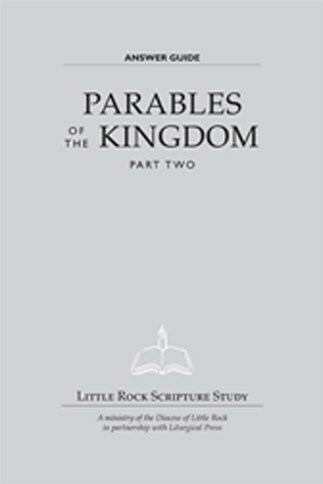 Those who have not participated in Little Rock Scripture Study's Parables of the Kingdom—Part One are urged to read the commentary's Introduction, pp. 1–15, before beginning this study. Mary Ann Getty-Sullivan holds an S.T.D. from the Catholic University of Louvain in Belgium. She has been teaching New Testament courses in colleges and seminaries for more than thirty years and has recently retired from teaching full time to devote more time to writing and lecturing. Mary Ann has written several commentaries on the Letters of Saint Paul. Her recent books include Women in the New Testament ( Liturgical Press) , the companion commentary to the Little Rock Scripture Study of the same name. Some of the most memorable teachings of Jesus were delivered as parables and are found in the Gospels of Matthew, Mark, and Luke (the Synoptic Gospels). This study focuses on the parables unique to Matthew, and those developed by Luke. Many of these parables have the power to change or alter one's image of God and how God relates to people, others deal with how God expects us to relate to each other. The study explores different ways the parables can be interpreted while allowing participants to use their own judgment. The parables offer a glimpse into the kingdom of God and invite us to think in new and fresh ways.